Dr. Christine Schutz first travelled to Nepal to visit her Nepali friends and experience the different cultures and the majestic beauty of the Himalayas in 2000. “It was an amazing and transformative experience. The contrasts of the great beauty of the country, the rich culture and terrible poverty of the people was so moving. As a psychologist I have seen a lot of suffering but the lack of such basic things that we all take for granted here in the USA was overwhelming. Clean water, toilets and garbage collection, basic medical care, public education, and government resources for poor children are lacking in Nepal. Christine visits program in 2003. "I remember going for a run in the morning near Swayambhunuth Temple in Kathmandu and seeing small children, maybe 3 or 4, one with a cleft palate climbing in the piles of garbage alone looking for food. Jauuka, Lexmi, Rabian, Rekha, and friends in 2003. 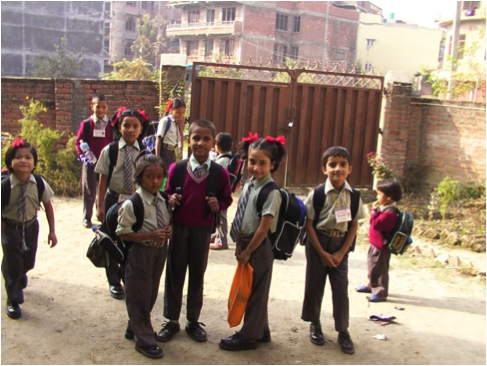 That was the beginning of Mitrata Nepal Foundation for Children (MNFC). By 2010, MNFC was supporting 100 children for school, housing and medical care and also began supporting the Contact Center, an early childhood develepment day program that prepares underpriveledged children to enter school. Children who are victims of child labor, often on the street and not in school are given meals and assisted by teachers to begin the process of education. When ready, they are transferred to school sponsorships in private schools to continue their education. Christine travels to Nepal every year to consult regularly with the local partners to oversee finances, organizational development and communications. She also stays in regular communication with our NGO partner to ensure that the programs are progressing and well managed. Christine, with NGO Director Leena, President, Yogesh and staff member, Susmita traveling to visit new children for the program in Godavri, Nepal. Christine takes volunteers, sponsors and friends to visit and experience the culture and beauty of Nepal. "Through the years of the civil war, it was difficult to find others to go with me to Nepal. But in recent years after the signed peace accord, we have had some wonderful trips with sponsors who meet the children they have corresponded with for years. There are lots of tears of joy in these reunions and lots of fun too." Dr. Sandra Hoffmann, Vice President, and Steve Schirber, child sponsor enjoy a special ice cream delight with the girls! Sponsor Joy with her sponsored child, Sarbhada enjoying time together. Sponsor Reva with her sponsored child Bibek in a shop til they drop! Rabina working with patients at Dhulekhel Hospital and getting her nursing degree.